The theme of this year’s school is Chelys Anglica: The English Viol. The school will dive deep into music for the viol and the broader repertoire of English music. Expect to encounter your favourites — Jenkins, Lawes, and Gibbons — but go further with the motets of Byrd and Tallis, explore the contenance angloise and the music of the early fifteenth century, get to know the great manuscripts of earlier English music such as the Old Hall Manuscript and the Eton Choirbook and investigate the byways of the viol in England, including the consort anthem and the lyra viol. The school will be held in Canberra from Friday 19 April – Sunday 21 April and Richard Boothby will be the International Tutor. Friday 30th March to Monday 2 April at the Melbourne Conservatorium of Music. 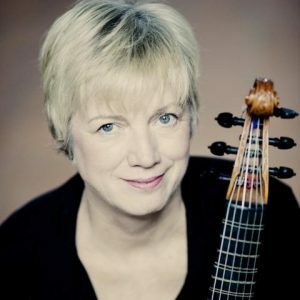 We are delighted to welcome the distinguished and pioneering viol consort player Wendy Gillespie as our Overseas Tutor, Easter Viol School, 2017. Wendy will offer a Choices class “Before the Fantasia” including a plain and easy guide to early notation. The theme of this year’s workshop is La Dolce Vita. All things Italian! In honour of Monteverdi’s 450th birthday we will play his Ave Maris Stella from the Vespers, 1610. And we revel in Isaac’s Italian style with selections from his Missa La Bassadanza written during the 10 years he worked for the Medicis in Florence. We explore how Italian madrigals and Venetian polychoral works influenced the development of the English Fantasia. The school offers opportunities for players from beginners to advanced, including a Beginner Scholarship program. We are looking for some photos taken at the Easter Viol School, particularly of the dance class. If you have some, Suzanne Ferguson would like to use them for reviews written for the AVDGS journal and also the VDGSA journal. Please let us know! Michal Prokop (http://michalprokop.com/) moved to Australian two years ago. He is based in Taree, NSW, and is a bespoke maker of historically based violins, violas, cellos and viols. Michal will make an instrument to suit your needs and also undertakes repairs, bow restrings, etc. Other makers in Australia are listed here. The 2015 National Easter Viol School will be held in Canberra at the Australian National University School of Music from Friday 3 April to Monday 6 April. The theme of the school will be The Viol in France. The Australian Viola da Gamba Society is currently revamping and updating our website. Please be patient as we transition across our content. Pop back soon to see the result of our hard work!